Well, I spent quite a few nights in Bangkok and I loved this full, nonstop, 100% of the time action city. Before even starting my review I must say that the city is huge. Like really huge. And while it does lack modern transportation and direct lines to many places it has its charm and I loved taking old buses, taxis, boats, metro and tuk tuks to reach the places that I wanted to visit. 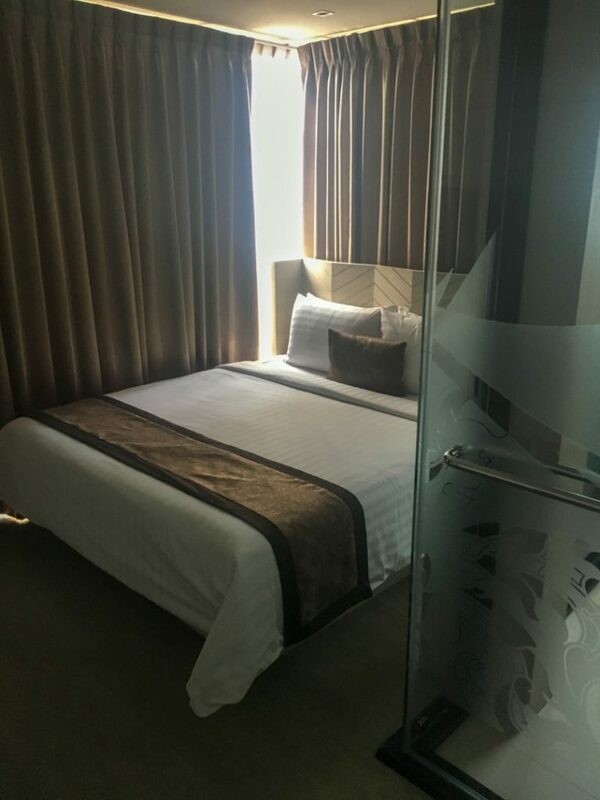 After my lovely stay in Chiang Mai I flew to Bangkok and for that reason I looked for a hotel in a good area, easy to reach from the airport and relatively close to the main attractions. Having all these in mind I chose the Aspira G Sukhumvit 33 hotel and below you can read my review of it. First and most important it is very easy to reach it from the airport. From Suvarnabhumi Airport you just get on the BTS SkyTrain with one change until you reach Phrom Phong Station from where you will walk straight for 150 meters, turn right on Sukhumvit Alley 33 and walk about 300 meters until you reach the hotel. The hotel’s address is 14/1 Soi Sukhumvit 33 (Daeng Udom) and you can find more about this place here. The Grand Palace is 9.9 kilometers away, Wat Arun is 10.3 kilometers away ( you will probably see these two amazing places in the same day since they are one across each other ) and Lumpini Park is 4.7 kilometers away. Remember what I told you at start? BIG city. I had no problems reaching these places by the means of transport pointed out earlier and I also walked a lot but if you read my articles you know that I always manage to walk quite a lot during my trips. Personally I loved this place. It felt new, it was amazingly clean and it was just one of those places that you want to return to. The staff was great. Great, great, great. Being in a city 9900 kilometers away from home the advices, the help with dry cleaning my clothes, booking my trip to the floating market thru the hotel, pointers and directions, all came of great help so I can honestly say that this was one of the best experiences during my trips. 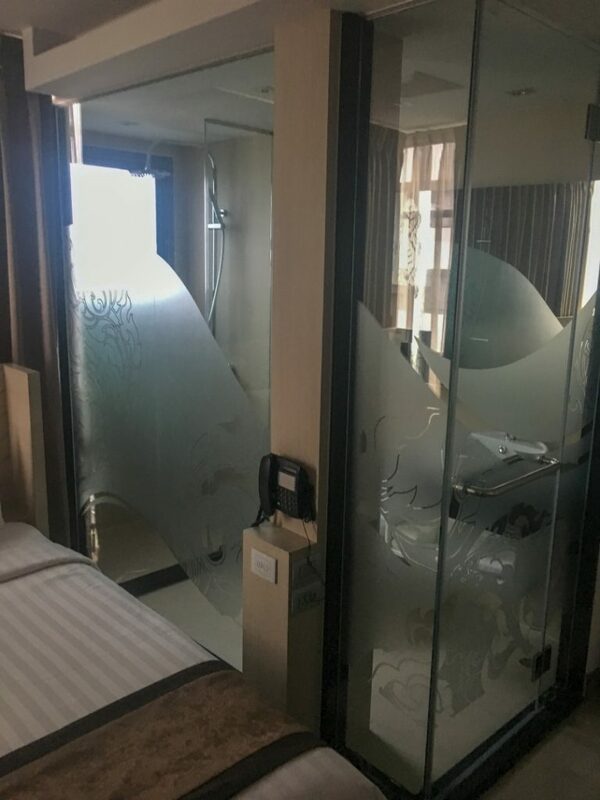 The room was medium sized with a large bed, TV and an open shower/bathroom window. Yes you were able to see thru the glass but since I was travelling alone it was OK for me. The bathroom was medium sized but very clean. I must stress this point again since I really was impressed with this aspect. The bed was made each day and each day I received bottled water from the hotel, which in a city where temperatures reached a real feel of 39 degrees C in January when I got there, and I really enjoyed this small token of hospitality. From the hotel you can select a variety of trips and travels. I only chose the floating market one but there are quite a few options available for the travelers that reach this place. As stated before this place offers dry cleaning so I was glad I was able to clean my clothes for the trip back home for such a cheap price. All in all I can wholeheartedly recommend this place. Since it is not close to a main street its noise levels are down and the windows of the hotel keep the noise down. As a bonus the hotel helped me negotiate a good price for driving at night in Chinatown and for the driver to wait for me there while I was taking pictures so they totally have my vote of confidence. If ever in Bangkok again I would definitely stay here again.